Your character attempts to collect as much wealth as possible on four unique levels of play. Avoid certain enemies. On the first stage, your character wanders through a maze picking up piles of gold by walking over them. 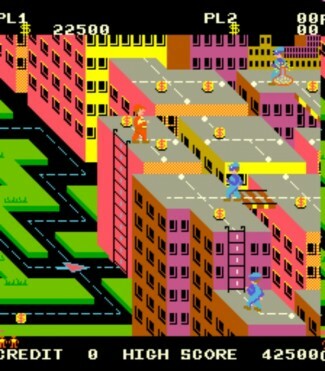 On the second level, jump from rooftop to rooftop to collect the money. On both the first and second stages, your character must avoid blue-clad thugs police? and spiders who will try to mug him and take his wealth. Collecting a potion on either stage will allow you to wipe out the thugs and spiders by touching them. On the third level, your character swims through a body of water to collect the piles of gold on the islands while avoiding the sharks and crocodile that lurk about. The final stage has you driving your jeep across canyons, jumping crevasses and avoiding boulders tossed at you. If you reach home, you are awarded a bonus based on how many gold bags you picked up, and the game begins again with increased difficulty. This game has speech. When you first start the game, it says, “Now you can go, and get the money!” When you start the car mission, it says, “Take the car, the bank is near!” When you finish the game, it say, “I’m in the Money!” and plays the tune Money Makes The World Go Round (from the musical Cabaret). Enemies are not tracked off the side of the screen, and must always reeneter from the right side. This can be used to control and group enemies.